You wake up and hop in the shower. Get your hair wet. Grab the bar of shampoo. Wait a second — bar of shampoo? Yeah, that’s right. It’s not only a real thing — it’s THE real thing: salon-quality solid shampoo made by Minnesota-based HiBAR. They even make solid conditioner that keeps your hair silky-smooth. The idea behind HiBAR’s solid shower products began a few years back when four eco-conscious friends got together at a party and began talking about the usual stuff. You know, the kids, the weather, how bad the Vikings were that year. But it wasn’t long before they were all on the same page about a certain topic: plastic in places where it doesn’t belong, namely, oceans and beaches. This may sound like a coastal issue, but that’s far from the truth. The cycle usually begins when storm runoff drains into river systems, bringing debris along for the ride. From there, plastic embarks on a journey to the ocean, where it plans to live happily ever after. Since Minnesota is the starting point of the mighty Mississippi, America’s largest river, the group was quick to notice that living all the way up here doesn’t exempt them from the issue — in fact, it makes Minnesota one of the sources of the issue. Their conversation about plastic in places where it doesn’t belong carried on. Plastic doesn’t belong in rivers. Plastic doesn’t belong in oceans. Plastic doesn’t belong in… bathrooms? Bathrooms are a major source of ocean plastic, as over 305 million Americans (more than 93% of the U.S. population) use shampoo on an almost-daily basis, and most of that shampoo comes in plastic bottles. Holy plastic, a change was necessary. The party the group was attending may have ended, but their conversation continues today. After years of deliberation, chemistry, prototyping and testing, they created HiBAR: salon-quality solid shampoo and conditioner that uses absolutely zero plastic. The product inspires people to reduce single-use plastic in their bathrooms and lives. So, the next time you wake up, hop in the shower and reach for the bar of shampoo, don’t question it. Question everyone who doesn’t have a bar of shampoo in their bathroom. 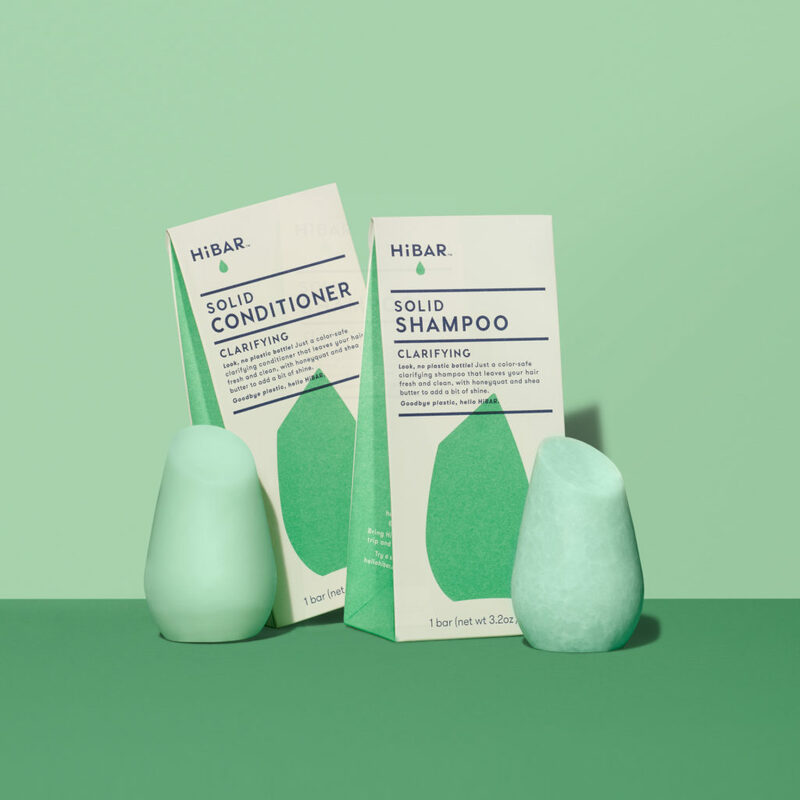 HiBAR shampoo and conditioner was available in our April 2019 Spring Renewal box.